The Stockton Pass Ranch is located along Highway 266 approximately 35 miles north of Willcox and 25 miles south of Safford, Arizona. 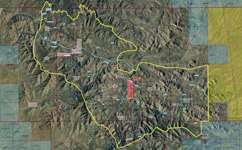 The Ranch lies in a beautiful mountainous area known as Stockton Pass. The topography consists of rolling hills separated by broad valleys in some of the most spectacular scenery of southeastern Arizona. The Ranch has an older home that is approximately 1,600 square feet in size with three bedrooms and one bathroom. There is a set of corrals, storage building and covered garage at this location. The elevation varies from 4,300’ to 6,800’ above sea level. The lower elevations consist of desert grassland with grama grasses, lovegrasses, alfileria and mesquite being the primary species. The upper elevations contain Oak-Juniper grasslands with a variety of native grasses and browse species. The Ranch is well watered with an extensive system of pipelines fed by several natural springs. 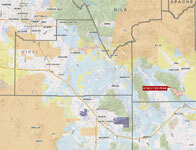 There are two wells on the Deeded and Private Grazing Lease parcels. The Ranch is cross fenced into several pastures for ease of operation. Electricity may be supplied by generator or solar. Telephone service is provided by cell phone. Propane can be delivered by local suppliers. The Stockton Pass Ranch is a unique mountain ranch for southeastern Arizona. 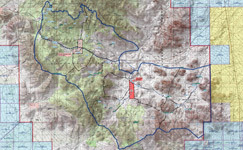 There are very few private parcels within the National Forest in this corner of Arizona. This ranch has a very desirable 160 acre parcel completely surrounded by National Forest. The scarcity of such parcels, combined with the beautiful natural scenery surrounding this parcel, creates a tremendous investment opportunity while enjoying all of the benefits of a rural lifestyle. Cattle may be purchased separately. Please click here to download (about 11 MB) a printable brochure in Adobe Acrobat format. If you get frustrated trying to make this work on your computer, don't hesitate to ask us to mail you a printed and bound brochure instead. Walter Lane has also handled the adjacent Hook Open A and O Bar O Ranches.